The Emmy nominated “The Girl” implies that Hitchcock deliberately tried to harm his leading lady with broken glass after she rejected an alleged kiss in the car on the way back from Bodega Bay to the Santa Rosa Motel in March 1962. Filming of the phone booth attack took place in mid June 1962, almost three months later, with much studio filming taking place in between at Universal. 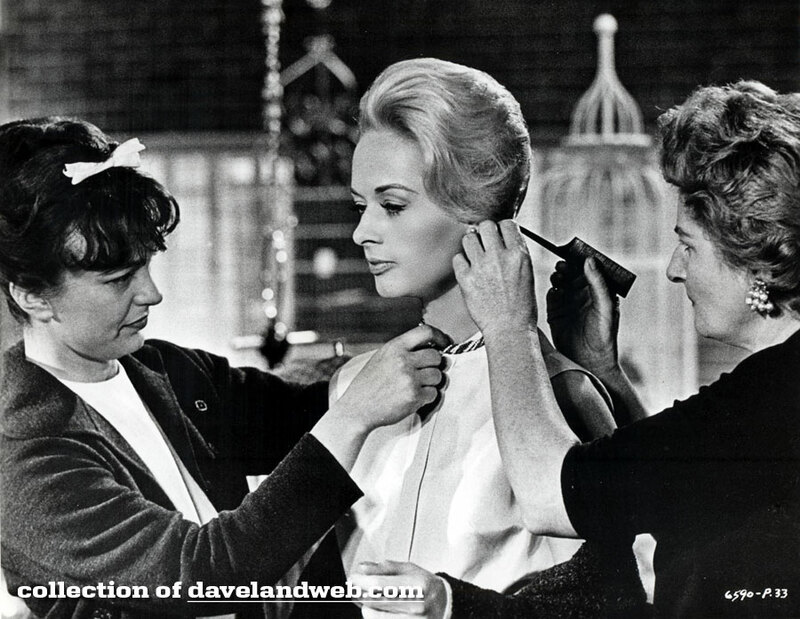 Now three of the Crew Members and On-set witnesses, Los Thurman the script supervisor, Rita Riggs the wardrobe mistress and Virginia Darcy the hairdresser, all deny that the smashing of the phone booth was a deliberate attempt by Hitchcock to harm Tippi. Moreover, the call sheets at the Margaret Herrick Library show that the filming of the pet shop scene (pictured) took place the day after the phone booth, with no visible signs of physical harm to the leading lady.